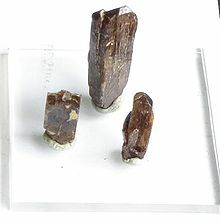 Dysprosium was first identified in 1886 by Paul Émile Lecoq de Boisbaudran, but it was not isolated in pure form until the development of ion exchange techniques in the 1950s. Dysprosium has relatively few applications where it cannot be replaced by other chemical elements. It is used for its high thermal neutron absorption cross-section in making control rods in nuclear reactors, for its high magnetic susceptibility in data storage applications, and as a component of Terfenol-D (a magnetostrictive material). Soluble dysprosium salts are mildly toxic, while the insoluble salts are considered non-toxic. Dysprosium and holmium have the highest magnetic strengths of the elements, especially at low temperatures. Dysprosium has a simple ferromagnetic ordering at temperatures below 85 K (−188.2 °C). Above 85 K (−188.2 °C), it turns into a helical antiferromagnetic state in which all of the atomic moments in a particular basal plane layer are parallel, and oriented at a fixed angle to the moments of adjacent layers. This unusual antiferromagnetism transforms into a disordered (paramagnetic) state at 179 K (−94 °C). The resulting compound, dysprosium(III) sulfate, is noticeably paramagnetic. Dysprosium halides, such as DyF3 and DyBr3, tend to take on a yellow color. Dysprosium oxide, also known as dysprosia, is a white powder that is highly magnetic, more so than iron oxide. Dysprosium combines with various non-metals at high temperatures to form binary compounds with varying composition and oxidation states +3 and sometimes +2, such as DyN, DyP, DyH2 and DyH3; DyS, DyS2, Dy2S3 and Dy5S7; DyB2, DyB4, DyB6 and DyB12, as well as Dy3C and Dy2C3. Dysprosium carbonate, Dy2(CO3)3, and dysprosium sulfate, Dy2(SO4)3, result from similar reactions. Most dysprosium compounds are soluble in water, though dysprosium carbonate tetrahydrate (Dy2(CO3)3·4H2O) and dysprosium oxalate decahydrate (Dy2(C2O4)3·10H2O) are both insoluble in water. Two of the most abundant dysprosium carbonates, tengerite-(Dy) (Dy2(CO3)3·2–3H2O) and kozoite-(Dy) (DyCO3(OH)) are known to form via a poorly ordered (amorphous) precursor phase with a formula of Dy2(CO3)3·4H2O. This amorphous precursor consists of highly hydrated spherical nanoparticles of 10–20 nm diameter that are exceptionally stable under dry treatment at ambient and high temperatures. Naturally occurring dysprosium is composed of seven isotopes: 156Dy, 158Dy, 160Dy, 161Dy, 162Dy, 163Dy, and 164Dy. These are all considered stable, although 156Dy can theoretically undergo alpha decay with a half-life of over 1×1018 years. Of the naturally occurring isotopes, 164Dy is the most abundant at 28%, followed by 162Dy at 26%. The least abundant is 156Dy at 0.06%. Twenty-nine radioisotopes have also been synthesized, ranging in atomic mass from 138 to 173. The most stable of these is 154Dy, with a half-life of approximately 3×106 years, followed by 159Dy with a half-life of 144.4 days. The least stable is 138Dy, with a half-life of 200 ms. As a general rule, isotopes that are lighter than the stable isotopes tend to decay primarily by β+ decay, while those that are heavier tend to decay by β− decay. However, 154Dy decays primarily by alpha decay, and 152Dy and 159Dy decay primarily by electron capture. Dysprosium also has at least 11 metastable isomers, ranging in atomic mass from 140 to 165. The most stable of these is 165mDy, which has a half-life of 1.257 minutes. 149Dy has two metastable isomers, the second of which, 149m2Dy, has a half-life of 28 ns. In 1878, erbium ores were found to contain the oxides of holmium and thulium. French chemist Paul Émile Lecoq de Boisbaudran, while working with holmium oxide, separated dysprosium oxide from it in Paris in 1886. His procedure for isolating the dysprosium involved dissolving dysprosium oxide in acid, then adding ammonia to precipitate the hydroxide. He was only able to isolate dysprosium from its oxide after more than 30 attempts at his procedure. On succeeding, he named the element dysprosium from the Greek dysprositos (δυσπρόσιτος), meaning "hard to get". The element was not isolated in relatively pure form until after the development of ion exchange techniques by Frank Spedding at Iowa State University in the early 1950s. While dysprosium is never encountered as a free element, it is found in many minerals, including xenotime, fergusonite, gadolinite, euxenite, polycrase, blomstrandine, monazite and bastnäsite, often with erbium and holmium or other rare earth elements. No dysprosium-dominant mineral (that is, with dysprosium prevailing over other rare earths in the composition) has yet been found. In the high-yttrium version of these, dysprosium happens to be the most abundant of the heavy lanthanides, comprising up to 7–8% of the concentrate (as compared to about 65% for yttrium). The concentration of Dy in the Earth's crust is about 5.2 mg/kg and in sea water 0.9 ng/L. The components are placed in a tantalum crucible and fired in a helium atmosphere. As the reaction progresses, the resulting halide compounds and molten dysprosium separate due to differences in density. When the mixture cools, the dysprosium can be cut away from the impurities. About 100 tonnes of dysprosium are produced worldwide each year, with 99% of that total produced in China. Dysprosium prices have climbed nearly twentyfold, from $7 per pound in 2003, to $130 a pound in late 2010. The price increased to $1,400/kg in 2011 but fell to $240 in 2015, largely due to illegal production in China which circumvented government restrictions. Currently, most dysprosium is being obtained from the ion-adsorption clay ores of southern China. As of November 2018[update] the Browns Range Project pilot plant, 160 km south east of Halls Creek, Western Australia is producing 50 tonnes (49 long tons) per annum. According to the United States Department of Energy, the wide range of its current and projected uses, together with the lack of any immediately suitable replacement, makes dysprosium the single most critical element for emerging clean energy technologies - even their most conservative projections predict a shortfall of dysprosium before 2015. As of late 2015, there is a nascent rare earth (including dysprosium) extraction industry in Australia. Dysprosium is used, in conjunction with vanadium and other elements, in making laser materials and commercial lighting. Because of dysprosium's high thermal-neutron absorption cross-section, dysprosium-oxide–nickel cermets are used in neutron-absorbing control rods in nuclear reactors. Dysprosium–cadmium chalcogenides are sources of infrared radiation, which is useful for studying chemical reactions. Because dysprosium and its compounds are highly susceptible to magnetization, they are employed in various data-storage applications, such as in hard disks. Dysprosium is increasingly in demand for the permanent magnets used in electric car motors and wind turbine generators. Neodymium–iron–boron magnets can have up to 6% of the neodymium substituted by dysprosium to raise the coercivity for demanding applications, such as drive motors for electric vehicles and generators for wind turbines. This substitution would require up to 100 grams of dysprosium per electric car produced. Based on Toyota's projected 2 million units per year, the use of dysprosium in applications such as this would quickly exhaust its available supply. The dysprosium substitution may also be useful in other applications because it improves the corrosion resistance of the magnets. 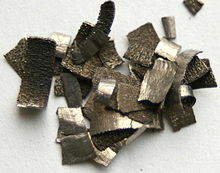 Dysprosium is one of the components of Terfenol-D, along with iron and terbium. Terfenol-D has the highest room-temperature magnetostriction of any known material; which is employed in transducers, wide-band mechanical resonators, and high-precision liquid-fuel injectors. Dysprosium is used in dosimeters for measuring ionizing radiation. Crystals of calcium sulfate or calcium fluoride are doped with dysprosium. When these crystals are exposed to radiation, the dysprosium atoms become excited and luminescent. The luminescence can be measured to determine the degree of exposure to which the dosimeter has been subjected. Nanofibers of dysprosium compounds have high strength and a large surface area. Therefore, they can be used to reinforce other materials and act as a catalyst. Fibers of dysprosium oxide fluoride can be produced by heating an aqueous solution of DyBr3 and NaF to 450 °C at 450 bars for 17 hours. This material is remarkably robust, surviving over 100 hours in various aqueous solutions at temperatures exceeding 400 °C without redissolving or aggregating. Dysprosium iodide and dysprosium bromide are used in high-intensity metal-halide lamps. These compounds dissociate near the hot center of the lamp, releasing isolated dysprosium atoms. The latter re-emit light in the green and red part of the spectrum, thereby effectively producing bright light. Several paramagnetic crystal salts of dysprosium (Dysprosium Gallium Garnet, DGG; Dysprosium Aluminum Garnet, DAG; Dysprosium Iron Garnet, DyIG) are used in adiabatic demagnetization refrigerators. The trivalent dysprosium ion (Dy3+) has been studied due its downshifting luminescence properties. Dy-doped yttrium aluminium garnet (YAG:Dy) excited in the ultraviolet region of the electromagnetic spectrum results in the emission of photons of longer wavelength in the visible region. This idea is the basis for a new generation of UV-pumped white light emitting diodes. Like many powders, dysprosium powder may present an explosion hazard when mixed with air and when an ignition source is present. Thin foils of the substance can also be ignited by sparks or by static electricity. Dysprosium fires cannot be put out by water. It can react with water to produce flammable hydrogen gas. Dysprosium chloride fires, however, can be extinguished with water, while dysprosium fluoride and dysprosium oxide are non-flammable. Dysprosium nitrate, Dy(NO3)3, is a strong oxidizing agent and will readily ignite on contact with organic substances. 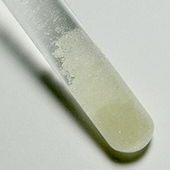 Soluble dysprosium salts, such as dysprosium chloride and dysprosium nitrate, are mildly toxic when ingested. Based on the toxicity of dysprosium chloride to mice, it is estimated that the ingestion of 500 grams or more could be fatal to a human. The insoluble salts, however, are non-toxic. ^ a b Lide, David R., ed. (2007–2008). "Dysprosium". CRC Handbook of Chemistry and Physics. 4. New York: CRC Press. p. 11. ISBN 978-0-8493-0488-0. ^ a b c d e f Emsley, John (2001). Nature's Building Blocks. Oxford: Oxford University Press. pp. 129–132. ISBN 978-0-19-850341-5. ^ a b c Krebs, Robert E. (1998). "Dysprosium". The History and Use of our Earth's Chemical Elements. Greenwood Press. pp. 234–235. ISBN 978-0-313-30123-0. ^ Jackson, Mike (2000). "Wherefore Gadolinium? Magnetism of the Rare Earths" (PDF). IRM Quarterly. 10 (3): 6. ^ "Chemical reactions of Dysprosium". Webelements. Retrieved 2012-08-16. ^ a b Patnaik, Pradyot (2003). Handbook of Inorganic Chemical Compounds. McGraw-Hill. pp. 289–290. ISBN 978-0-07-049439-8. Retrieved 2009-06-06. ^ a b c Heiserman, David L. (1992). Exploring Chemical Elements and their Compounds. TAB Books. pp. 236–238. ISBN 978-0-8306-3018-9. ^ Perry, D. L. (1995). Handbook of Inorganic Compounds. CRC Press. pp. 152–154. ISBN 978-0-8493-8671-8. ^ Jantsch, G.; Ohl, A. (1911). "Zur Kenntnis der Verbindungen des Dysprosiums". Berichte der Deutschen Chemischen Gesellschaft. 44 (2): 1274–1280. doi:10.1002/cber.19110440215. ^ de Boisbaudran, Paul Émile Lecoq (1886). "L'holmine (ou terre X de M Soret) contient au moins deux radicaux métallique (Holminia contains at least two metal)". Comptes Rendus (in French). 143: 1003–1006. ^ Naumov, A. V. (2008). "Review of the World Market of Rare-Earth Metals". Russian Journal of Non-Ferrous Metals. 49 (1): 14–22. doi:10.1007/s11981-008-1004-6 (inactive 2018-09-22). ^ Gupta, C. K.; Krishnamurthy N. (2005). Extractive Metallurgy of Rare Earths. CRC Press. ISBN 978-0-415-33340-5. ^ "Dysprosium (Dy) - Chemical properties, Health and Environmental effects". Lenntech Water treatment & air purification Holding B.V. 2008. Retrieved 2009-06-02. ^ a b Bradsher, Keith (December 29, 2010). "In China, Illegal Rare Earth Mines Face Crackdown". The New York Times. ^ Bradsher, Keith (December 25, 2009). "Earth-Friendly Elements, Mined Destructively". The New York Times. ^ Brann, Matt (November 27, 2011). "Halls Creek turning into a hub for rare earths". ^ Amit, Sinha; Sharma, Beant Prakash (2005). "Development of Dysprosium Titanate Based Ceramics". Journal of the American Ceramic Society. 88 (4): 1064–1066. doi:10.1111/j.1551-2916.2005.00211.x. ^ Lagowski, J. J., ed. (2004). Chemistry Foundations and Applications. 2. Thomson Gale. pp. 267–268. ISBN 978-0-02-865724-0. ^ Bourzac, Katherine. "The Rare Earth Crisis". MIT Technology Review, 19 April 2011. Retrieved 18 June 2016. ^ Shi, Fang, X.; Shi, Y.; Jiles, D. C. (1998). "Modeling of magnetic properties of heat treated Dy-doped NdFeBparticles bonded in isotropic and anisotropic arrangements". IEEE Transactions on Magnetics (Submitted manuscript). 34 (4): 1291–1293. Bibcode:1998ITM....34.1291F. doi:10.1109/20.706525. ^ Campbell, Peter (February 2008). "Supply and Demand, Part 2". Princeton Electro-Technology, Inc. Archived from the original on June 4, 2008. Retrieved 2008-11-09. ^ Yu, L. Q.; Wen, Y.; Yan, M. (2004). "Effects of Dy and Nb on the magnetic properties and corrosion resistance of sintered NdFeB". Journal of Magnetism and Magnetic Materials. 283 (2–3): 353–356. Bibcode:2004JMMM..283..353Y. doi:10.1016/j.jmmm.2004.06.006. ^ "What is Terfenol-D?". ETREMA Products, Inc. 2003. Archived from the original on 2015-05-10. Retrieved 2008-11-06. ^ Kellogg, Rick; Flatau, Alison (May 2004). "Wide Band Tunable Mechanical Resonator Employing the ΔE Effect of Terfenol-D". Journal of Intelligent Material Systems & Structures. 15 (5): 355–368. doi:10.1177/1045389X04040649. ^ Leavitt, Wendy (February 2000). "Take Terfenol-D and call me". Fleet Owner. 95 (2): 97. Retrieved 2008-11-06. ^ "Supercritical Water Oxidation/Synthesis". Pacific Northwest National Laboratory. Archived from the original on 2008-04-20. Retrieved 2009-06-06. ^ Hoffman, M.M. ; Young, J.S. ; Fulton, J.L. (2000). "Unusual dysprosium ceramic nano-fiber growth in a supercritical aqueous solution". J. Mater. Sci. 35 (16): 4177. Bibcode:2000JMatS..35.4177H. doi:10.1023/A:1004875413406. ^ Gray, Theodore (2009). The Elements. Black Dog and Leventhal Publishers. pp. 152–153. ISBN 978-1-57912-814-2. ^ Carreira, J. F. C. (2017). "YAG:Dy – Based single white light emitting phosphor produced by solution combustion synthesis". Journal of Luminescence. 183: 251–258. Bibcode:2017JLum..183..251C. doi:10.1016/j.jlumin.2016.11.017. Wikimedia Commons has media related to Dysprosium. Look up dysprosium in Wiktionary, the free dictionary.